The inexpensive version of a classic gift for men of all ages. Sure, this is not a swiss watch that will last forever, but for this price it will be a great gift with a distinguished touch that men of all ages will appreciate. Tell him how you really feel. Men really understand the language of love & respect. To them both together are really important. It reads: "ALWAYS REMEMBER: I LOVE FOR ALL THAT YOU ARE & I'M SO PROUD OF YOU" engraved on the front cover. The phrase it's laser engraved. Other versions are painted, or a sticker and won't last long. Ours will not be erased by the ins & outs of pockets. It's packaged on a strong and delicate black gift-box ready to give it to your husband, your son, your father, your boyfriend, your best friend or any man on your life. Men of all ages will appreciate this laser engraved pocket watch. Click ADD TO CART to grab this pocket watch. THE INEXPENSIVE VERSION OF A CLASSIC GIFT FOR MEN. A low priced gift with a distinguished touch. TELL HIM HOW YOU REALLY FEEL IN A WAY HE WILL APPRECIATE. Men of all ages crave love and respect. 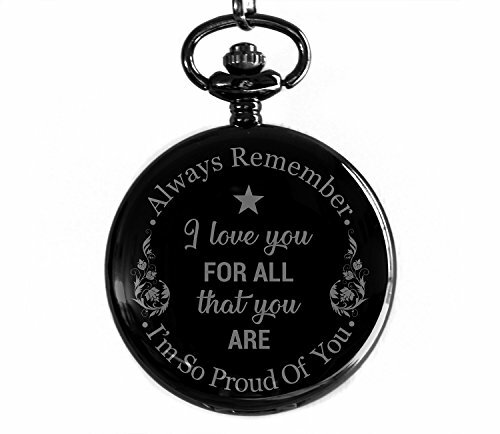 "ALWAYS REMEMBER: I LOVE FOR ALL THAT YOU ARE & I'M SO PROUD OF YOU" engraved on the front cover. LASER ENGRAVED PHRASE (not painted, not a sticker) that won't be deleted by ins & outs of pockets. GIFT BOX INCLUDED. For a better experience, please remove the sticker from the bottom of the box. If you have any questions about this product by Cronos, contact us by completing and submitting the form below. If you are looking for a specif part number, please include it with your message.